PEDRO FEBRERO: "At some point, people will stop valuing currency because money does not equal currency"
I’m usually so focused on Bitcoin and other cryptocurrencies that I forget where and why it all began – the true reason why we’re stuck in this never-ending cycle of debt and destruction. The obvious fact that no one likes to face and deal with is that our monetary system is bound to fail, much like every other fiat-based system has. Throughout history, all great men who have tried to impose their will have failed miserably, and the reason is always the same: at some point, people will stop valuing currency because money does not equal currency. Whereas you can use a currency to trade and to count value, you cannot use currency to store value – not in the same way you use gold, silver, or Bitcoin. I feel I’m getting ahead of myself here, so let’s start from the beginning. Monetary discussions always begin by defining what money is. Looking at the graphic above, it becomes clear what features an asset needs to be considered money. First off, money needs to be a store of value. You need to have a way to store value in the long term, like a savings account that won’t devalue. For this to be possible, we must endow money-assets with durability. The two strongest assets considered money for as long as the world can remember have been silver and gold. What other characteristics does an asset need? Well, looking at currency, we understand that each unit is the same anywhere, as in the value of one unit of monetary currency is the same in the UK as it is in China. This means money needs to be fungible and interchangeable. 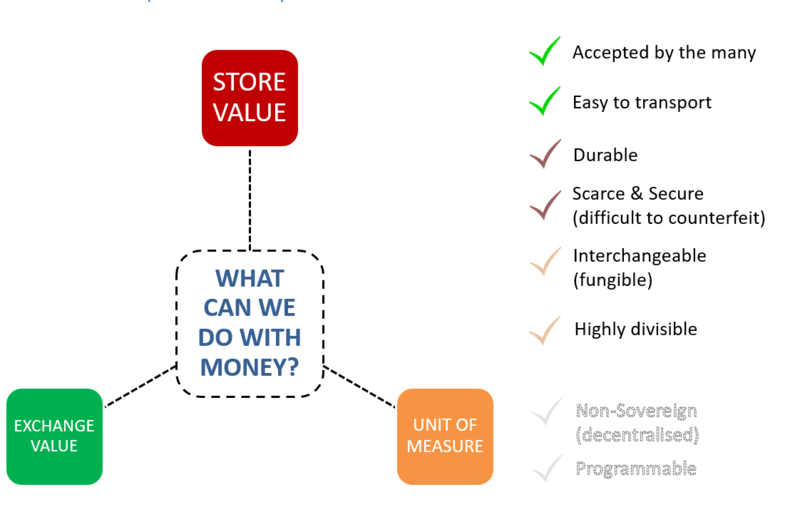 Finally, money needs to be a great medium of exchange, meaning it should be easy to transport and to transform into smaller units (divisibility). Plus, due to Bitcoin, money can also be programmable. Currency is an application of money. In fact, all the world’s currency is actually worthless as it is backed by nothing. Sound money like gold or Bitcoin have value due to their limited supply and minting ownership capabilities. This makes BTC valuable – unlike fiat currency, which is backed by trust in certain governments or policies. Simply put, although money is always currency, currency may not be money (like fiat currencies). What this means is that anyone who wishes to store value must do so in another form of money, like Bitcoin, gold, silver, or property. Because currencies are produced by a closed group of privateers who care more about personal profits and not the interest of the people, the system is bound to inflate. This means the quantity of currency available in the market will likely increase as it’s the easiest way to control production and prices. By minting more or fewer coins and notes, what banks do is contract or expand the monetary supply, meaning the economy will boom or bust according to how tightly the grip is held. Interestingly enough, there is no fiat-based economy that can outlive sound money, as shown so many times in the past. This is mainly due to hyperinflation – the major killer of fiat currencies. The story usually goes something like this: a government creates too much debt by creating too many additional units of currency that gets locked up by big institutions. When said money gets to the street, prices begin to inflate out of control. What always happens is people start ditching the fiat currency and looking for sound money like gold or silver. Of course, now we all have Bitcoin as well. When your government or economy starts to tumble – because it will – the easiest and safest way to maintain value is by owning Bitcoin. It’s as simple as that. Because Bitcoin is decentralised and each owner can be the sole owner of his/her coins, Bitcoin becomes the most important weapon fighting for individual freedom and rights. Let’s hope more people heed the call before it’s too late.